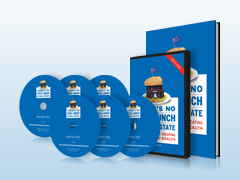 There’s No Free Lunch in Real Estate is a proven program and real estate investment course that outlines techniques and real estate investment strategies to help investors build life-changing wealth. Jon Swire, one of the nation’s leading real estate gurus and professionals offers his expertise on how to build long-term real estate investment success through his program, which includes a book, DVDs, models to analyze real estate investments, and powerful online learning tools. Through this program, you can unlock real estate investing secrets and get on your path to financial freedom. Jon covers why you should invest in real estate and offers the tools, techniques, and confidence you need to build your own multi-million dollar real estate portfolio. The program offers detailed information on real estate investing strategy and the benefits of investing in real estate to build lasting wealth. Jon Swire is an author and teacher at UCLA Extension and is an expert on how to make money in real estate. His real estate investment book, titled There’s No Free Lunch in Real Estate, details the advantages of investing in real estate and its tenets can help you become financially independent through real estate investing. This unique real estate education program also includes online learning and free information to help you get started in real estate investing today.